by Òscar Palau. Originally published in El Punt Avui in Catalan on March 31, 2013. Translated here with permission. Despite his youth, Roger Albinyana i Saigí (Barcelona, 1980) has acumulated a notable amount of experience in foreign affairs. After studying Economics and International Relations, he led the Joventut Liberal Europea [European Liberal Youth] between 2004 and 2008 before cofounding and directing for two years the Cercle d'Estudis Soberanistes [Sovereigntist Study Circle]. From 2011 on, he was the director of the governmental program, Unió per la Mediterrània [Mediterranean Union]. 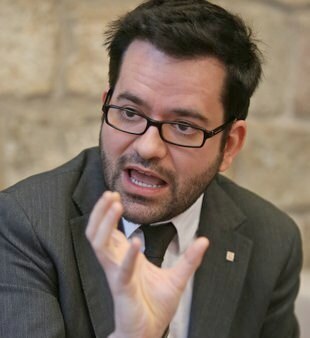 He has been a member of CDC [Convergència Democràtica de Catalunya, Catalan political party] since 1997 and a coordinator of international relations since 2011. In January he was named Secretary of Foreign Affairs, and thus directs one of the key areas in the pro-sovereignty process. 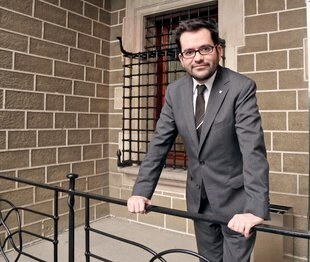 Roger Albinyana has taken on the post of Secretary of Foreign and EU Affairs and wants to work hard, but discretely. Diplomatic relations in any country always have a visible part and one that is more discrete, but we are a government that values transparency and are happy to offer explanations where necessary. What level of cooperation with the process have you noticed up to now? It feels like Catalan society is hoping for cooperation from the international community toward the process, but that is a misguided perception. In the two months since we've been working, we have had contacts with various European governments and it's important that we're completely transparent: At this point, there is no country, either within or outside of the EU, that is encouraging the process. Our understanding is that they are observing it from a distance. That is the case now and it has been the case in any previous process of national emancipation; the reaction from the international community has always been lukewarm*. It's important to be realistic, and it's important that the people know the perspective that these countries have, that is, that they do not look kindly on the process. Does that mean that it is good news that they're not taking a position? Absolutely. Their neutrality is excellent news. You said it was necessary to make it clear that this is not an internal conflict. in the office of the Secretary. In some way, we have to make it understood that what is going on in Catalonia is a dialectical discourse with the Spanish State, because if not, in the eyes of the international community, the problem does not exist. The process must be perceived as a problem that has to be resolved not only by the Spanish State but by the countries of the EU and beyond, as a whole. But until the Catalan people make their position clear, the process will continue to be considered an internal matter. If a unilateral referendum is necessary in the end, the international community won't understand it? This process has various stages and it's very important that the Catalan institutions follow through on each one. Right now, we have to open all possible channels for dialog with the Spanish government so that the referendum can be held thanks to a pacted agreeement, as in Scotland. This is without a doubt the scenario that most suits us, although it's not the only possible way. We have established a path toward the exercise of our right to self-determination and to the point that it's possible, we must forge agreements. Is Scotland a reference point? The two situations don't have anything in common; they and we have distinct motives and we both note that our respective situations are unique. At the same time, we see that they have been able to negotiate the terms and the date for their referendum and to the extent that we can, we should be able to do the same. Will the date of the Scottish referendum affect the choice of the date in Catalonia? They have chosen a day that makes sense according to their interests and in Catalonia we should do the same, and not be dependent on any outside process. Can the right to self-determination be claimed, since it is recognized by international organizations and even by the Spanish State? The support for self-determination in international legislation is pretty minimal, because the Declaration of Human Rights is not a treaty that obligates the parties. The Spanish State was very careful when signing to not recognize this right itself. Our exit must result from dialog between the parties, just as there was even with South Sudan. I refer to the position of the European Commission that, beyond the declarations and counterdeclarations, is given through official communications or as answers to specific petitions. And the position is that there is no official position, because no member state has asked for a position on any particular case. In the treaties, there is no reference that takes into account such a process, either for or against. That makes us believe that this is not a process that has a resolution within European legislation—those who say that [Catalonia] would be automatically excluded from the EU are lying—but rather that there must be a political discussion, and that eventually there will have to be negotiations between the member states, the European institutions, and Catalonia. To get to this point, however, we need a clear and unequivocal message, that is, a referendum. Until then, there will be no negotiations, no foreign institution will speak out about Catalonia. Is there an idea of the timing of an eventual negotiation? Since there is no automatic legal mechanism to follow, the situation must be understood in political terms, and we must apply a dose of common sense. Catalonia is a territory with 7 and a half million people, with a geostrategical position that is important to the whole of Europe and a GDP of 200 billion euros. Who can imagine that Catalonia will be sidelined from the main group if there is an incontrovertible democratic will in favor of moving toward an independent state integrated with the European institutions? It's true that joining the EU requires unanimity, but the Spanish State is very dependent on the other states in the EU, especially now that it has a notably weak foreign position, and thus is quite susceptible to being influenced. When the treaties say that the EU is based on principles of democracy, human rights, and respect for minorities, we speak about that. We are Europeans, and any act that would take away those rights and obligations will have a very high political cost, not only for Spain but for the whole of Europe, whose projects of unity and integration would be severely questioned. Does Spain's weakness favor Catalonia? Spain's weakness toward the outside might imply the facilitation of internal processes, though it's important to note that Catalonia has not taken its position based on Spain's weakness. However, we Catalans must be able to explain that Spain can make it on its own without Catalonia because the process that we are undertaking is not a process against Spain, but rather, in the medium and long term, one that should strengthen Spain. We have to know how to express that idea to the international community because the current situation of the internal relationships is not good for the Spanish State either. We have to develop a credible discourse that makes it clear that Spain not only will make it through, but that it will benefit in the end. Have you felt Spanish pressure against the process abroad? Spain does what it deems necessary and therefore, it's felt, because they try to boycott actions abroad, especially with respect to business. The embassies have very clear instructions. You don't like the Spanish government's bill on foreign activity. Have you spoken to them about it? Not directly, but there has been an offer from the ministry to negotiate the aspects that we don't like. It is our opinion that they clearly invade our jurisdiction in matters of foreign policy; we are the only [autonomous] community with two chapters dedicated to this in our Statute and this new law puts the Catalan government on a par with local entities, when it is up to us to coordinate their activities. It violates existing law and we will make those allegations clear, and if necessary, we will negotiate. If the law continues as presented, we will oppose it. 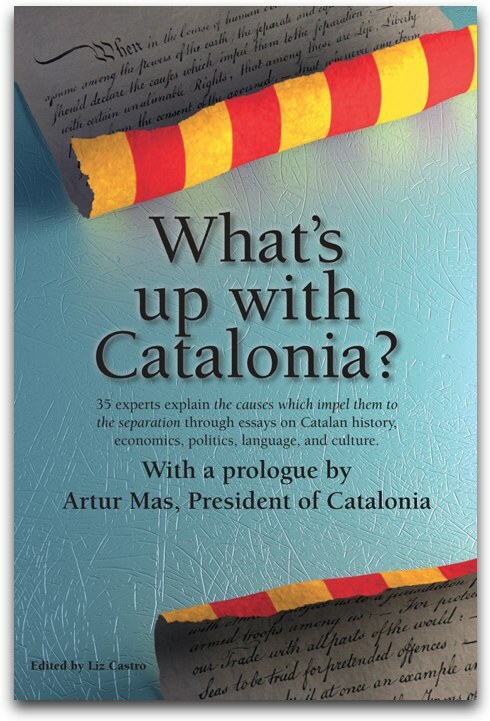 Is Catalan law the answer? No, the need to organize foreign affairs, EU affairs, and cooperation on development was already in the electoral platforms of both CiU and ERC. The goal is to move forward in the design of state structures, but we must carefully follow current legislation, because if we ask the State to comply, we have to apply the same criteria to ourselves. Right now, the government has a wide margin with respect to foreign affairs and is covered by the current legislation in effect, but there are limits imposed by the budget. With the resources that we have we can do more, and better. Not just with the delegations abroad but also in the defense of our interests in Europe, where the financial framework of 2014-2020 is already being negotiated, and from which new opportunities are emerging. It's more important than ever for the government to position itself properly in the EU in order to get the most out of it, and to demostrate to the Catalan people that our membership is useful from this vantage point. Catalan communities abroad want to help. What can they do? We have 128 of them, with 20 particularly active. We have ramped up communications, sending them information on what's going on, talking points... They have a presence in other civil organizations abroad and can act as a means of communication not of the government, but of the process, because this isn't developed from top to bottom, but rather has an all important grassroots base, without which it would be impossible. Therefore, our intention is for the communities abroad to participate, from their respective countries. Yes, we are studying that and don't yet have a clear answer. What do the delegations abroad do? Let's be specific. The delegation in Brussels is quite strong, with more clearly delineated functions because it exists in a framework in which it is officially recognized. The others don't have a diplomatic status because Spain has never wanted to give them one, in contrast with the delegations in Flanders or in Quebec, and thus have more difficult functions, with political and institutional representation, of being in contact with the media, of internationalizing the economics in contact with business leaders, in contact with the local community, and in publicizing and explaining the Catalan situation. Yes, because the process that we're are going through is very interesting to the international media, since it is a civil process that demands leadership and support from political leaders. Many correspondents were and are in Madrid, and until recently they only received information from there, but the interest generated from the demonstration has been palpable, and through the communications group Eugeni Xammar, similar to that of many other governments, we have been able to put that in order. Not exactly. It's a concept invented by the English and Americans, and responds to the fact that it's more necessary to involve the civil society in foreign affairs. With public diplomacy we try to lay out a model of how a future Catalan foreign service would look like, not based on classic state criteria but rather on the sovereignty of the 21st century, with a shared process. All of that will be thoroughly studied but the process that we are initiating allows us to reinvent ourselves as a country, and one of the areas in which we can do the most work is in foreign affairs. It's clear that, realistically, and given our needs and current financial capacity, Catalonia will not be able to allow itself a foreign network as extensive as the Spanish one, but that doesn't interest us anyway, given that theirs hasn't had particularly effective results. *NB. The literal translation would be "quite cold" which might seem to contradict the word I've chosen, "lukewarm". However, I think "lukewarm" better conveys the resistance and negativity implied in the original, and has none of the romantic connotation that "cold" has.